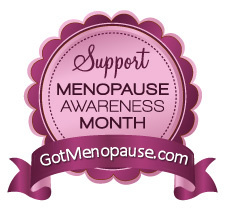 Sometimes we forget that there are still PLENTY of women who are experiencing the first signs of peri-menopause because so many of us have "been there, done that" and have had many years of thousands of pages of information on the internet, not to mention tv shows, podcasts and videos all discussing symptoms, treatments and hormones in general. When I started the Minnie Pauz website (about 18 years ago), there wasn't anyone talking about it except for one other wonderful site called Power Surge. There's been so much information that we are sometimes overloaded and still don't know where to turn. My point is this, now that most of you have learned the ropes and have your favorite sources of information, maybe you could use this month to help the women who are overwhelmed with TOO much info and are getting dizzy with all the contradictions in the news and advertisements! If you can help just one woman who might be looking for a place to start or looking for some encouragement and support, you should feel really good about yourself!! This is just one of the thousands of emails I have received over the years and it helped remind me that there will ALWAYS be someone who is searching for information and, most of all, reassurance regarding menopause. Do you know who "Minnie Pauz" is? She's a woman, much like you if you are a woman with hormones, if you are a babyboomer, if you are single, married or divorced, quite simply, she's "everywoman". She is a little bit (or a lot) of all of us, depending on how you see her. 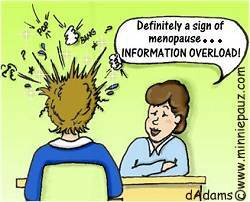 She's not a doctor or an expert on menopause, but she gets letters that ask about medical issues all the time. That's when she sends people to real experts, like the ones listed on this page. "Minnie" is very happy to respond to questions about weight gain and chocolate though! The main thing that "Minnie Pauz" brings to the table is a sense of humor about the whole subject of aging and feeling like the fun has gone out of our lives just because we're "changing". She only likes to be photographed from the back because she's feels that is her best "asset" and she's not so proud of her double chins and those dark hairs that keep popping out on her chin(s) and upper lip! The aging process is inevitable but some do it better than others so we've GOT to laugh about it or we're doomed to feeling miserable for the next 30 to 40 years! Hey, that's a lot of time to do things we always wanted to do and still time to take care of ourselves and have FUN! After 18 years, the Minnie Pauz website is getting a makeover, so as we progress, I may be able to show you bits and pieces of it in the near future to get your opinions, as well as asking what kind of improvements you might like to see. I will be bringing back some favorite features like the caption contest that everyone enjoyed so much too! Stay tuned, stay in touch and stay COOL! !